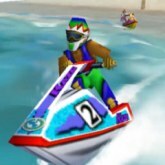 Description: Wave Race 64 is probably still ne of the best Jet Ski games to this day. It features 3 different gameplay modes including Championship, Time Trials, and Stunt Mode. Trying to win races can be challenging make sure you are passing on correct sides of buoys. Pass red colored bouys on the right side and yellow colored buoys on the left side. When going through buoys correctly flags will light up and the jet ski might be able to obtain max speed. It also has some tricks, dolphins and a lot of cool ramps. A classic that should not be missed. Game Controls: Enter Key = Start Button. "W,A,S,D" Keys = Move. "K" Key = Accelerate. "L" Key = Change Camera View.